Irma Louise "Lou" Lacour Doescher, born February 24, 1921, passed away Sunday, October 21, 2018 at the age of 97. Daughter of the late Thomas John Lacour and Alice Sutton Lacour. Beloved wife of 64 years to the late Philip A. Doescher Sr. Blessed with two loving children: Philip A. Doescher Jr. (Ardith) and Donna Ann Doescher Poche (Barry). 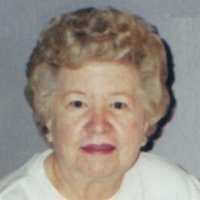 Beloved grandmother of Kimberly "Kim" Chastant-Poche (Julie), Chad Poche, Shannon D. Thornhill, Allison D. Mayers (Chad), Kristen D. Whaley (Ward) and Philip "Kip" Doescher III (Amanda). Beloved great-grandmother of William (Liam) Chastant-Poche, Lillian Chastant-Poche, Evan Poche, Ian Poche, Catherine Poche, Ainsley Poche, John Coney Thornhill, Jacob Mayers and August Doescher. Sister of the late Lurry Lacour, Lillian Lacour Ledoux, Earl Lacour and Mae Lacour Martin. Also survived by numerous nieces and nephews. A native of Kenner, LA, raised in Marksville, LA, and a resident of River Ridge, LA for the past 53 years. Proud owner of Lou’s Beauty Shop in Kenner during World War II. The family would like to thank Passages Hospice and NOLA Home Care for their kindness and compassion in caring for Grandma. Relatives and friends are invited to attend a Mass of Christian Burial at Garden of Memories Funeral Home, 4900 Airline Drive in Metairie, LA on Friday, November 2, 2018 at 12:00 noon. Visitation will be held from 10:00 am until Mass time. Interment will follow in the Garden of Memories Cemetery.